Two-way portable Wireless Audio Transceiver (WAT01-TW). 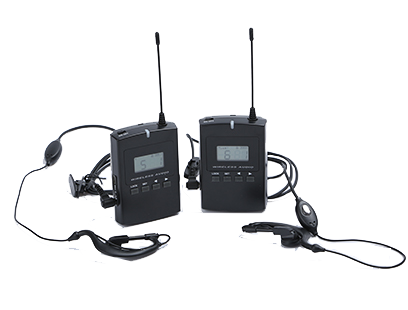 The bidirectional wireless communication system consists of a signal transmitter and a set of receivers/transmitters. The guide speaks to the transmitter and visitors can hear him in the receivers. When the user presses a button on the receiver, he or she can talk to the handset and everyone else can hear it. This allows a group and a guide from one trip to interact with people from another group. This solution is very good for excursions to large facilities such as factories, historic mines, etc. Mix Tech Poland Sp. z o.o.